Little Emma's room is finally done (I had posted a nursery sneak peek about a month ago)!!! I have four weeks and four days to go and I'm so glad I got a head start on this big project! My energy levels are now way down and I feel like I'm carrying the world's largest and heaviest watermelon. There's no way I would've been able to paint and decorate in my condition and in this god awful heat. My legs, ankles and feet are finally starting to swell and so is my face. Oh yes, I definitely have that I'm pregnant and I need to give birth soon or else look. Of course it didn't help that I had family visiting last week and we've been eating non-stop. My mom arrived from California this weekend, she'll be staying until the end of August to help out with Emma. I had my last baby shower this weekend and I just want to say thank you to my sister Mary Jane (who came all the way up from Texas) for throwing the party and to my sister Cecile (all the way from California) for lending her decorating & games/entertainment expertise! Hillsy and I are very lucky and grateful to have you guys! A special thank you to my cousin Ely for hosting it at her lovely home and of course to all of my aunts and cousins who were able to attend. We played lots of games and ate lots and lots of good Filipino food - I'm still recuperating. Marichelle, it is absolutely beautiful. Such a calming space. You can feel the love with every detail. Can't wait to see Emma. She's one lucky girl. It's absolutely stunning! One of the neatest nurseries I've ever seen. Congrats and good luck with her arrival! Such an honor to be included, thanks Marichelle! It's really a stunning space, so sweet & cozy and full of light! It's beautiful! Little Emma is so lucky. My sister-in-lawish (long story) didn't have the room done until after the baby was born...we thought she was crazy!! I am definitely a planner like you, so mine will probably be done months in advance as well. 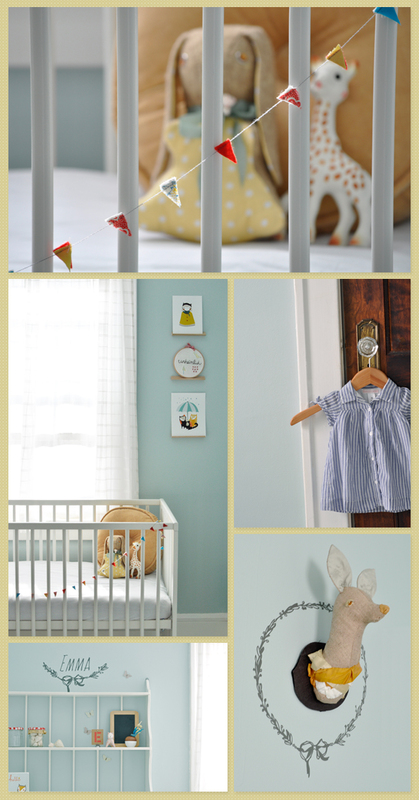 Aww, Emma's nursery turned out just dreamy! I love all the little details, like the closeup of the crib garland. So precious. Absolutely stunning Marichelle! The white and pail blue are my favorite colors. I used the same tones on my new studio. it is really, really beautiful, peaceful and serene! Enjoy spending time in there with your new little one! This is such a darling space! What a lucky girl Emma will be! 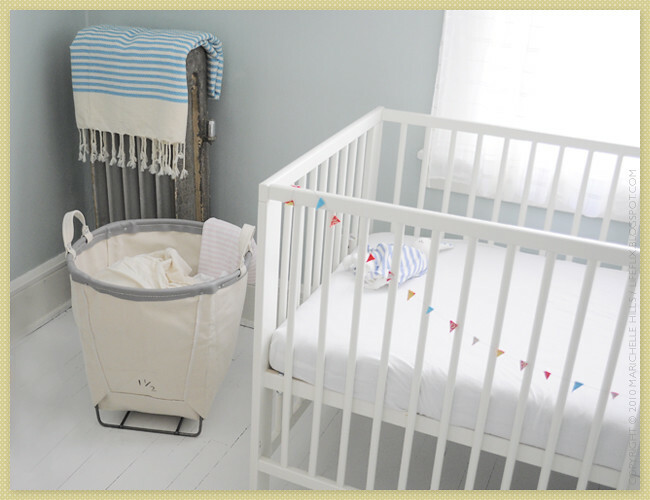 Love, love, love this peaceful and calm nursery. I may steal your paint color - it may be exactly what I've been looking for. I was bouncing between a light blue or a light gray, and have to run it by hubby first. I have 5 months left, or so, and have done NOTHING. I need to get busy, and fast! ya!!!!!! i love it--the wall color is so serene and it's all so pretty! you are so talented lady and little emma will enoy it so much..what a lucky little spud she'll be! I have a question: which of your photos of the room shows the truest version of your wall color? Some pictures look more gray, some more blue, and one or two with a touch of green. I like them all, but which is the best representation? Also, how big is that room? It looks tiny! Fabienne, you have plenty of time! Kristina: I'm not really sure of the exact dimensions. I was able to fit the crib, glider + ottoman, side table and dresser/changer so I suppose it's big enough. As for the paint color - believe it or not the color does transform into all of the different shades you see in the pictures. It really depends on the time of day and whether or not I have the chandelier on (which casts an extra layer of yellow). In natural light during the morning it's more like to top picture (right) - this room gets tons of light in the morning so it's really bright in there. During the afternoon it looks a bit more green (2nd set of photos, where you see half the crib and the prints on the wall), the walls look more grey like in the picture of the laundry basket during the day when the sun isn't directly shining in the room. I recommend buying a little tester pot and giving it a try in your room before painting the entire space. Hope that helps! Thanks so much for answering my questions. I will definitely buy a small bit of it to try it out (along with a bajillion other shades that I've fallen in love with - all neutral types of colors). Thanks! 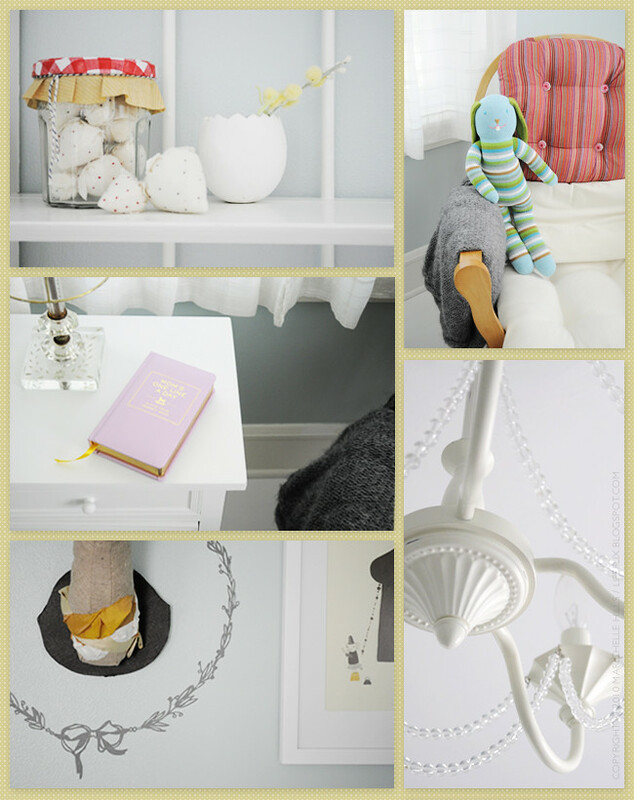 emma's room is so soft and soothing and filled with wonderful treasures, but the best is yet to come when she comes home. hope you all spend many happy hours in her sweet room. The nursery is BEAUTIFUL. Truly, amazing. And... I tried really, really hard not to leave this next comment.... but several hours later it was still bugging me, so I had to come back. Forgive me in advance? The crib garland is darling... but it is really freaking me out! And granted, my son is 18 months, and totally mobile, but I know he would have it wrapped around his neck in less than 4 seconds. So... yes, it is darling, but by the time little Emma is moving around/rolling, you may want to relocate it to somewhere out of her reach. Ok... overprotective/bossy/unwanted advice moment over. Forgive me? Beautiful nursery! It's feminine without being too girly, girly. I love the elements you made yourself, especially the tiny garland. Great job. Hi Paige! Thank you so much for your nice comment. AND no forgiveness necessary - I actually wrote a little caveat on my original post (http://lifeflix.blogspot.com/2010/06/for-our-little-emma.html) stating that I'm well aware of the dangers and will definitely be removing all items on/near the crib! So no worries! I'm with you on that one! Thanks RJ, Olivia and modbean! It´s a really calm and beautiful room. Congratulations for the new life! What a beautiful nursery! we would love to feature it at Baby Lifestyles Contact us to discuss if you're interested! My name is Lauren I'm the editor at Baby Lifestyles. This nursery looks like heaven. I'd love to feature it. Email me if you're interested.